Here is a figure painting demo done in a manner similar to the Reilly Painting Method. In this method of painting you start off with a burnt umber pick-out(a form of grisaille or under painting using only burnt umber and the white of the canvas to establish the drawing. Thinning the umber with "turp" or removing the paint from the surface with a rag or other implement to get lighter values). Next I use a controlled pallet consisting of five premixed values of red, yellow, grey and "fleshtone"(blue optional), I begin applying opaque "fleshtone" of matching values a top my underpainting. All along adjusting the "fleshtone" with same value reds, yellows and greys (endevoring to not mix between values) to obtain the natural fluxuations in the color of flesh without changing the value, except where I want to. This is a great way of breaking into painting for artists of great experience in tonal media, but little or no experience with colo r.
Here are some notes on my approach to the pallet. 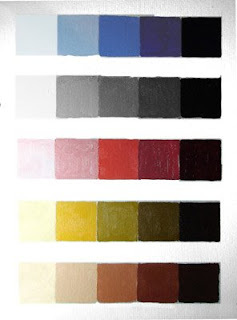 "What I have done here is mix up five values of each primary (red, yellow, blue) flesh tone and grey. For yellow I started with pure cadmium yellow in the second square and added titanium white to lighten and burnt umber to darken. For red I started with Scarlet Vermillion(or Cad Red Light) in the third square and added white to lighten and Alizarin Crimson and Ivory Black to darken. For grey I used just Titanium White and Ivory Black (in the absence of blue this functions in its place). For blue I start with French Ultramarine in the fourth spot and add white to lighten and black to darken. For the flesh tone I start with a base of Burnt Umber and add white to lighten it. This will tend to look ashen so I add red and yellow from the corresponding values to warm it up, tending more towards the yellows in the light values and reds in the dark values"
This is quite interesting. Would you happen to have step-by-step pictures/closeups and/or more detailed explanation for a novice? Hey this is pretty awesome, thanks for posting this. I've read about the Riley method but never got a good understanding of what it is. This helps though. Do you know any sources (books/videos) that talk about this more? Thanks again, i've been trying to break into painting. Could you post which colors you used in that limited pallet? I wish Faragasso would get around to getting that book back in print -- it's going for over $85 on the used market right now.